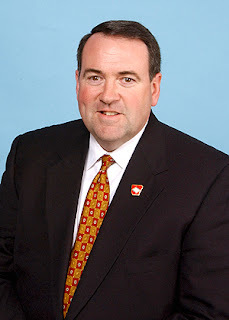 Voting for Mike Huckabee for president because he was a christian pastor would be like voting for Jimmy Baker for president because he was a christian pastor. Look through his "Awe Schucks" act and see him for what he really is. Mike Huckabee is a wolf in sheep's clothing that uses the religion card to push his own agenda. Somehow all of this is being overlooked. Or did he ask his deity for forgiveness so it's all good; "washed in the blood." And even then... just cause you are forgiven doesn't mean you should be president of these united states. Jesus Christ dealt with people like Huckabee... he called them hypocrites, white washed tombs and a den of snakes. Obrigado visitando meu blog. Eu espero-o do retorno a ele outra vez.